Suppliers are beginning their clearance sales like this one. They know that the bees are ready to emerge. Order TODAY… and be prepared to open your mail with bees crawling around inside the box. A list of my favorite vendors is at the end of this post. Osmia californica (left) and Osmia lignaria (right). Hard to tell with the O. californica but the O. lignaria male to female ratio looks appropriate, i.e. : 6:4. If you don't want to buy, you can trap nest instead. Just set out your house and wait for native bees find it. But bees like to use material that smells like bees before them ok'd the house, so a brand new house can be iffy. Greater success can be had if you stock it with cocoons or better yet filled reeds; they have the smell of approval. My first year I bought 20 cocoons and harvested 55 at the end of the season. Last year I purchased reeds full of orchard bees from masonbeesforsale.com and after they emerged, leaf cutter bees moved in. The Osmia unfortunately dispersed. More on that in my next post. 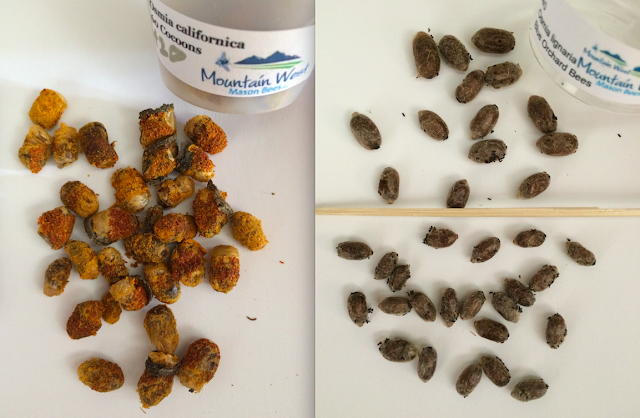 This year I tried a new vendor, Mountain West, whose cocoons are well under a dollar a piece. The cocoons have been out for over a week and not one bee has emerged despite our 20° above normal temperatures. Looking at my records, March 28 is when I've noted meconium in years past so I'm not worried yet. All the pear trees in the neighborhood are in full bloom with cherries and peaches already starting, so they're missing out on some amazing forage. Hopefully the bees will come out in time for the Crab Apples. With the crazy mild winter we had and the upcoming days of on-and-off moisture, the bloom is going to be EPIC. How's the bloom looking in your neck of the woods? See if these businesses can get cocoons to you in time.